Nothing quite beats sitting outside with your mates on a summer’s afternoon and sipping a nice cold beer. Bars. Fabulous havens for social gatherings. But sadly, criminals when it comes to waste. It looks like some progress is on the way with the new wave of banning plastic straws, but most of our favourite drinking establishments still have a terrible influence on the environment. Napkins galore, wasteful ice machines and plenty of food scraps, bars are places that encourage maximum consumption, and this has its consequences. It’s not just how bars are run and how well they recycle, it’s also what they stock. Most bars get their alcohol and food from other companies; this involves a lot of pre-packaging and transport emissions. Wouldn’t it be great if bars had a local, sustainable focus, using home-grown produce to achieve zero-waste? Enter Cafe de Ceuvel. This urban experiment, located in Amsterdam, ensures that every plate and glass they serve has the best environmental impact impossible. After hearing about our 30-day zero-waste challenge, a friend recommended De Ceuvel to us, and the Ginger and the Vegan were intrigued. A little research showed that they are an establishment working to be organic, sustainable and circular, and have almost achieved a zero-waste kitchen. They serve locally-brewed beers that are mostly organic, minimising their carbon footprint. When it comes to wine it's only sustainable, natural wine (Vin natural) which is grown without pesticides and doesn’t have any chemical additives. Do I hear guilt-free drinking? Located in Buiksloterham, an old industrial area, De Ceuvel is a key establishment in transforming this polluted area into a sustainable neighbourhood. And they’ve got a load of initiatives to help them achieve this. Basically, they’re nailing it with our five ‘R’s’: Refuse what you do not need. Reduce what you do need. Reuse what you consume. Recycle what you cannot refuse, reduce, or reuse. And Rot (compost) the rest. Naturally, we had to check De Ceuvel out. 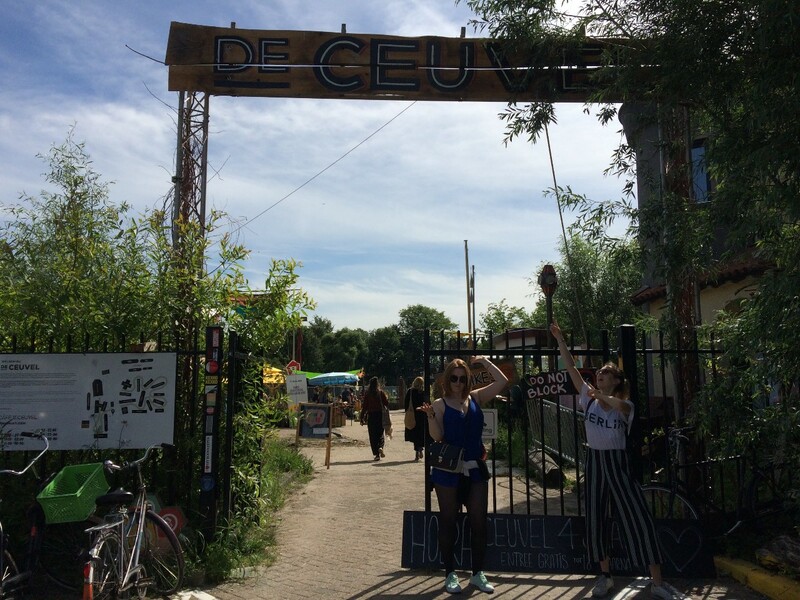 Coincidentally, the Ginger and the Vegan rocked up at Cafe de Ceuvel on the venue’s fourth birthday and they were having some awesome zero-waste celebrations. We immediately spotted their incredible recycling facilities, which was very refreshing: not something you usually see so obviously at a bar. 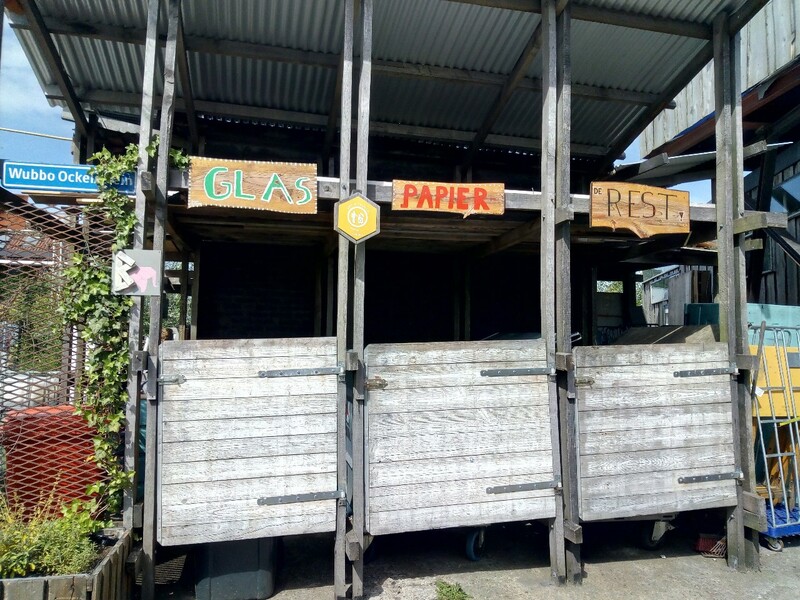 Then our eyes moved to all of the upcycled furniture: there were outdoor tables made of boats, lampshades made of glass bottles, and even an old beach shack had been transformed for reuse. Cafe de Ceuvel hosts Cleantech Playground, a planned sustainable cleantech utility. 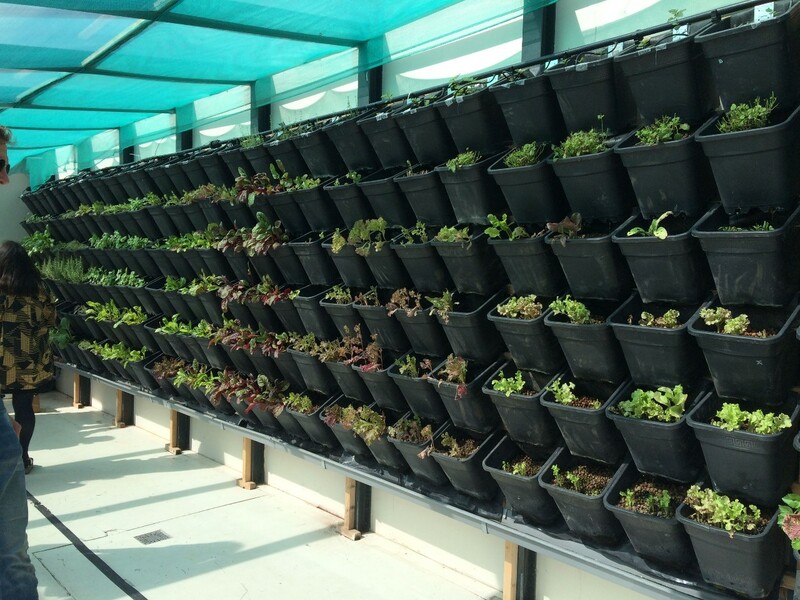 They have an aquaponics greenhouse, compost toilets, solar panels, systems to process wastewater, and re-circulate heating. They use food and human waste as fertiliser. This was a WASTELESS DREAM. De Ceuvel also promotes food sustainability and animal rights by not serving any meat; their traditional Dutch croquettes and bitterballen are filled with mushrooms they grow themselves. Local and sustainable veggies = Happy Vegan. 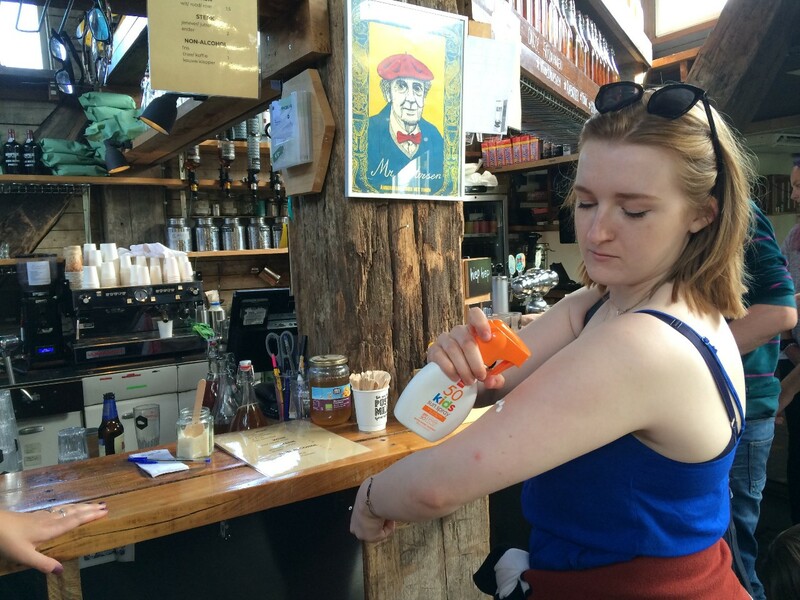 Free suncream to use = Happy Ginger. 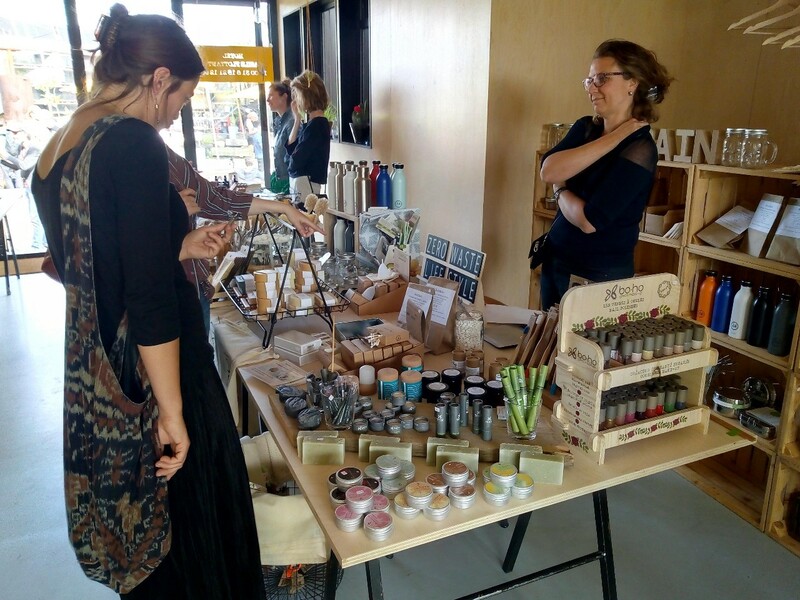 Since we happened to visit De Ceuvel on their birthday, there was a load of other unexpected zero-waste perks. They had a zero-waste shop onsite where Jas purchased a metal razor (stay tuned) and Morgana picked up some reusable makeup remover pads — she never has to use those wasteful cotton pads again. All in all, we had an incredible time and were very impressed with De Ceuvel (Morgana wants to move there immediately). But don’t be discouraged by how incredible De Ceuvel sounds if you don’t live in Amsterdam, places like this are starting to emerge all around, and numerous bars are shifting towards sustainability. Check out what’s occurring in your local area and enjoy your pints without causing problems for the planet. Read what Jas and Morgana were up to in the past 25 days.